The 2012 Chrysler 200 Convertible is set to debut at the 2011 New York Auto show later this year. Thanks to the lens work of one particularly wily spy photographer, we get a clear look at the drop-top ahead of schedule. This two-door, soft-top example was caught running around with a surprising lack of camo-cladding. Though we see a soft-top here, we can't rule out the inclusion of a retracting hardtop since the outgoing Sebring employed a variety of disappearing roofs over its lifetime. See for yourself in our high-res image gallery below. 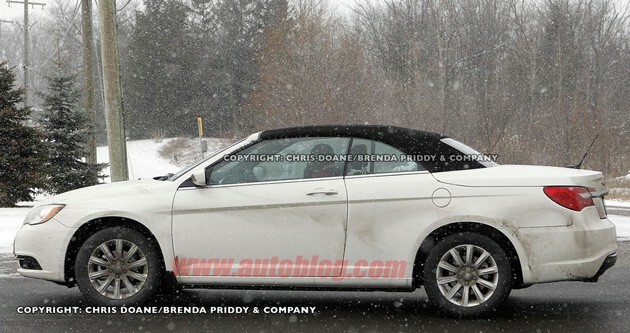 [source: Chris Doane/Brenda Priddy & Company]Spy Shots: 2012 Chrysler 200 Convertible playing in the snow originally appeared on Autoblog on Fri, 07 Jan 2011 17:27:00 EST. Please see our terms for use of feeds. Sebring with a new name... GHEY!!! I see the taillights have the little point like the new WRX. It is a Sebring lol all they did was refresh the inside&outside, new v6 and called it the 200. So is the 300, charger, advenger, compas, and so on. I love how the say 28 new models but 90% of them are only refreshes with new v6's. The only thing I sell is G. Cherokees, wranglers & m. vans. which is the funny stupid part they have so many cars that compeat against each other. 2 m. vans, 2 midsize cars, full size and there joke of econo gas sippers of small suv's ect. I work for a Jeep Chry Dodge dealer and wow this brand has no clue and if they dident have Jeep they would fail again. So much of the industry is going green, small cars, new smaller more powerful motors but not them! Too many frame on construction with big motors when everyone else uses unbody ect. there just so lost they dont even know it! all and all im not much of a fan. Dodge Challenger and a Jeep Wrangler.